I would like to introduce Dis-bud Mum this time. 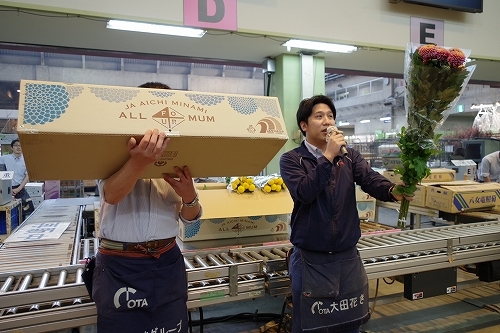 This flower is shipped from ALL4MUM Growers’ Cooperative of the JA Aichi Minami in Aichi prefecture. Although Dis-bud Mums do not have many multi-colored varieties, this variety – “Souls”, is bi-colored with pink and yellow. One of its charms is that the graduation of the color changes, dependent upon blooming seasons. At OTA market, “Souls” is shipped only from this Cooperative, and only one grower in this Cooperative produces this variety. It is, therefore, a rare variety. This Cooperative also cultivates another Dis-bud Mum variety and ships to OTA market. 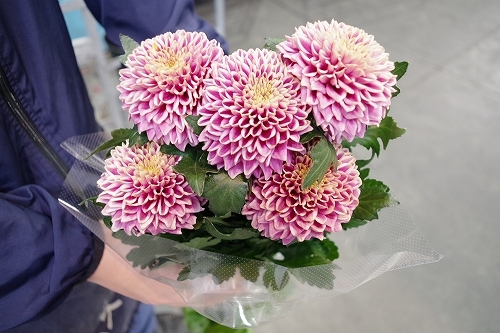 The variety, known as “Miyabi”, has the same flower shape and size as “Souls”. However, the difference in color distinguishes the two varieties. A mutation in the gene during the vegetative period of “Souls” results in bi-colored petals in orange and yellow. you can easily find it from the picture of “Miyabi”. From late April, our receipt of shipment will increase and the quality will get at higher grades. Mother’s Day is coming soon, and I expect the demand on the flower will increase.